Side 1 printed with 2 PMS colors using heavy coverage. 80lb Smooth White stock uncoated. Dental office Floreani O'Toole put its smiling logo front and center on the bright white flap, which symbolizes clients' new pearly white smiles. Silver panels and a gradient dot pattern give the design a sleek, modern look. 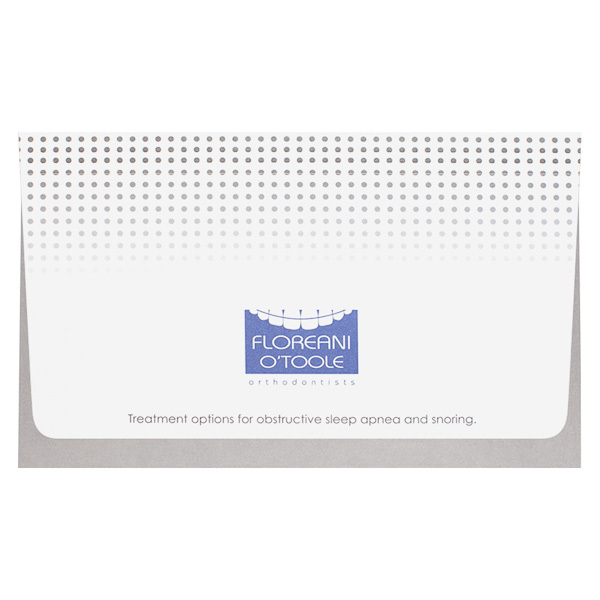 Taglines on both the flap and pocket exterior allude to the materials inside, which provide info about treating sleep apnea with oral appliance therapy. This subtly sets client expectations and prepares them to explore their treatment options. Side 1 printed with 3 foil stamped areas on uncoated 100lb Deep Black Linen stock. 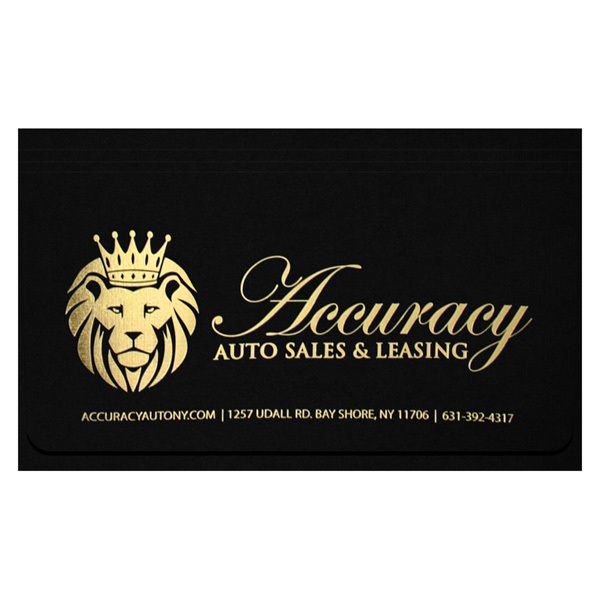 The metallic gold foil in this design (combined with the company's crowned lion logo) gives it a regal, luxurious appearance. The front features the business's contact information, while the back focuses more on the brands of vehicles being offered. Inside near the pocket's opening is a message congratulating recipients on their purchase. 2 PMS colors printed on Side 1 of uncoated 80lb White Smooth stock. This cute design smiles right back at dental patients with a curved orange bar. The warm color welcomes recipients and sets an upbeat tone for the office, in opposition to the typically cold and sterile medical industry. The logo itself shows the progression of a mouth from frown to smile, presumably as the patient's teeth get healthier. 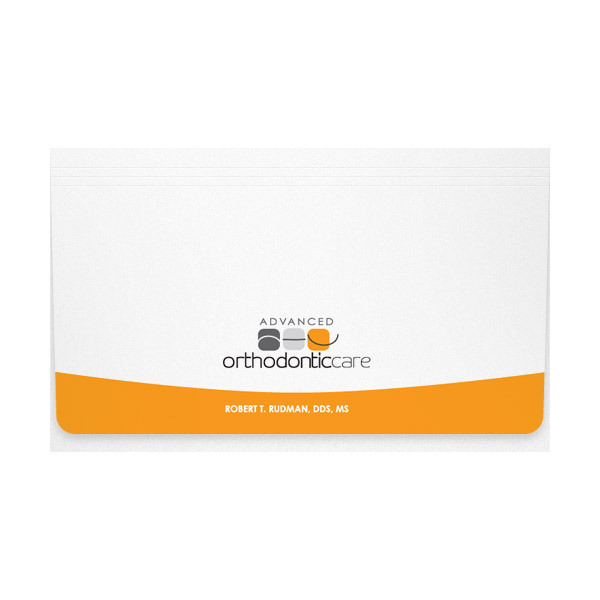 The matching orange pocket features a quote from the office's head orthodontist, Dr. Robert Rudman. Written in a messy decorative font, it resembles handwriting for a personalized touch. Contact information on the back lets patients schedule their next appointment. 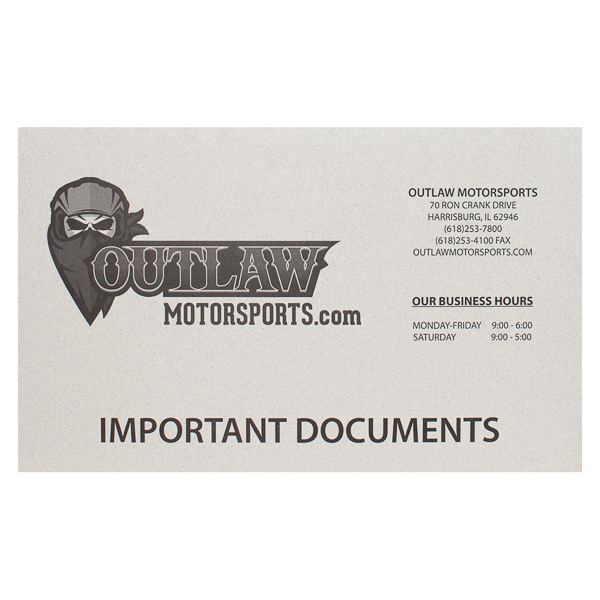 A masked bandit and wild west display font are the most prominent features on the front of this design for Outlaw Motorsports. The ATV and sport vehicle dealer keeps its layout simple, with contact info and business hours neatly sorted in the upper right corner. The bottom of the panel is clearly labeled “IMPORTANT DOCUMENTS,” helping set a serious tone. On the pocket exterior, owners can write in personal details, vehicle info, and maintenance records to make sure everything stays in one place. A single large pocket fully covers any 9 1/2" x 5 3/4" documents or tri-folded letter-sized papers. The extra-large flap extends over the pocket to ensure no important papers escape during a hectic day. Landscape orientation allows ample room for elongated, custom designs on either the interior or exterior. Print custom text—such as a travel checklist, automotive repair checklist, or other pertinent information—on the outside of the pocket so recipients see it as soon as they open the wallet-style flap.